Please contact the owner directly @ 516-852-6343 or justincfletcher(at)aol(dot)com.For all of you Chris-Craft fans, notice the 30&#39; Sportsman with the hull designed by legendary hull designer Ray Hunt. The engines are 250HP Marine Power engines that are married to (2) &amp;#8232;Props on straight drives which are undoubtedly nested within the Deep-V hull in order to &amp;#8232;achieve the unexpectedly shallow 32&quot; draft on a boat with such a deep &amp;#8232;hull profile. With a mere 46 hulls built, this is a rather rare find and often sought after by Chris-Craft enthusiasts. Added to this boat is a custom tower with upper helm station. This is a nice upgrade to this boat. It sort of mimic&#39;s the sister vessel of the Sportsman, the Tournament Fisherman. 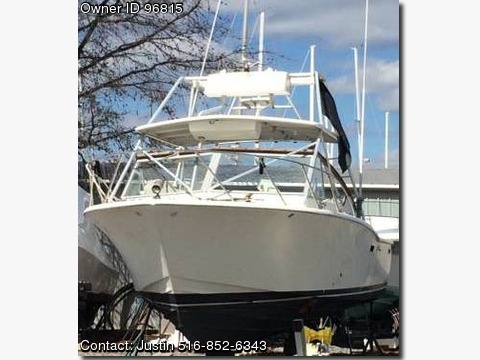 If you are in the market for a classic rare fishing boat, you have found it here.